Sponsorship of the Annual Meeting and Awards event. Recognition in program, event related media, invitations, and on site at the dinner. Dinner sponsorship includes 1 ticket for the event. The Annual Awards Meeting is the premier event of the Southwest Florida Regional Technology Partnership. Technology professionals from across industry sectors will connect and celebrate the 2017 accomplishments of their peers. Attendees will enjoy an engaging presentation. The evening will also highlight the recent accomplishments of the RTP and share the organization’s vision and goals going forward. 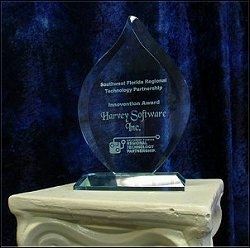 Innovention Award: Recognizing technical achievement by a Southwest Florida technology company. Transformation Award: Highlighting the use of technology in government, non-profit, or companies outside the IT sector to address a business or operational challenge. Tech Woman of the Year Award: Honors the accomplishments of a Southwest Florida woman in a technology role and her commitment to diversity in STEM fields. Partner Award: Honors a person who has made significant contribution to the Regional Technology Partnership. Archana Vemulapalli, General Manager, Network Services, IBM Global Technology Services will deliver the keynote address at the RTP's 10th annual Technology Awards Meeting on May 17. Prior to this role, she led next-generation technology initiatives at a variety of organizations from start-ups to major consulting firms to government, including serving as the Chief Technology Officer (CTO) for Washington, DC. Archana is the recipient of several honors, including the Washington Business Journal’s C-Suite Award, The Washingtonian Tech Titan Award, StateScoop’s Golden Executive of the Year Award & Top Women in Tech Award, as well as DC’s Top 50 Women in Tech Award.